The Rotator Cuff muscles control rotation of the shoulder. 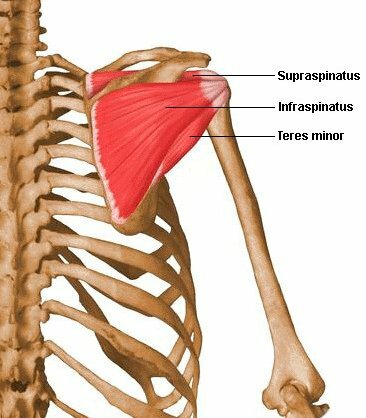 They consist of the infraspinatus teres minor and supraspinatus which rotate the shoulder outwards and the subscapularis which is one of the muscles which rotate the shoulder inwards. These muscles are put under a great deal of strain especially in throwing events and racket sports where your arm is above your head a lot. A sudden sharp pain in the shoulder would indicate a possible rupture of a tendon, while a gradual onset is more likely to be inflammation. Pain when you bend the arm and rotate it outwards against resistance. Pain on the outside of the shoulder possibly radiating down into the arm. Pain in the shoulder which is worse at night. Stiffness in the shoulder joint. Rest and ice the shoulder for 2 to 4 days depending on how bad the injury is. If the acute stage is over, pain and inflammation have settled down apply heat. Use sports massage and stretching techniques.